When slurping oysters whole for the first time, go for smaller varieties. Kumamotos, Olympias, Pacifics and other smaller oysters are modestly bite-sized, and famous for their flavor. 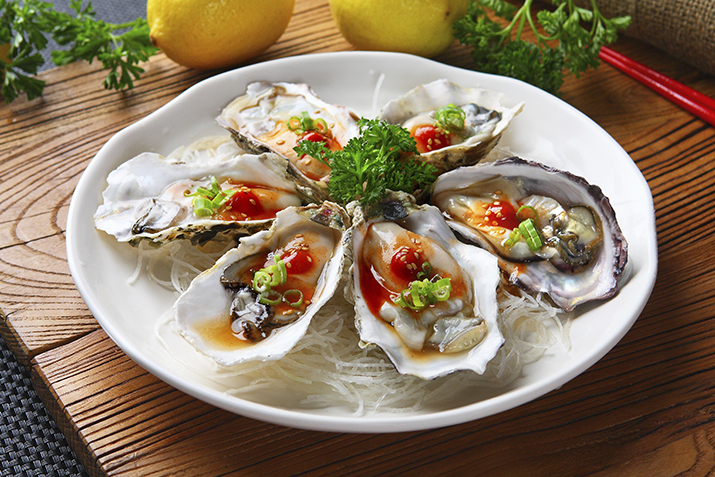 A bit of mignonette sauce adds a sour note that brings out the sweet, nutty flavors in your precious ocean gems. For the sauce, stir together the white pepper, vinegar, scallions and salt, and chill until time to serve. Arrange the daikon and lettuce on two medium plates as a decorative bedding to hold the shucked oysters; chill the prepared plates. Just before serving, open the oysters. You will need a sharp paring knife, and two towels. Place one towel on the counter and wrap your non-cutting hand in the other. This will protect your hand if the knife slips. Grip the oyster in the towel, holding it as level as possible, and insert the point of the knife in the seam between the shells, right next to the pointed end where the hinge is. Wiggle the knife in and give it a twist to pop open the hinge. Angle the knife so it follows the curve of the shell, so that you won't cut into the flesh inside. Guide the knife along the shell, opening it as you go. As it starts to come loose, angle the knife to follow the bottom shell, and cut the muscle where it attaches to the shell. Keep the oyster level so that the juices inside do not spill, if possible. Pull off the top shell, and use the point of the knife to remove any bits of shell or dirt that may have fallen in the liquid. Place on the prepared plate, and continue with the next oyster. Drizzle each oyster with a little mignonette, a drop of Tabasco and serve immediately.